This whipper is used in all of Gordon Ramsay’s kitchens! 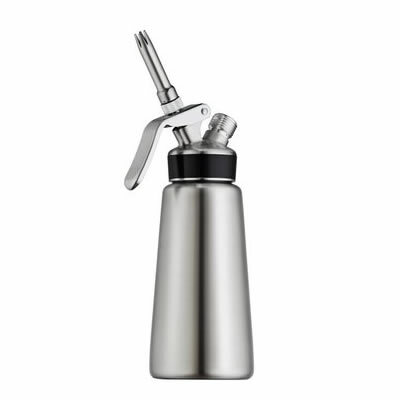 The perfect whipped cream dispenser for HACCP compliance in a catering kitchen. This 1/2L whipper will whip up to 3 Litres of fresh whipped cream or espumas in an instant! 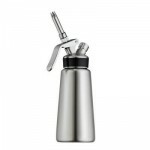 Uses 8g nitrous oxide (N2O) gas cartridges to whip and propel the cream. N2O cartridges are cheap and easy to use. N2O also acts as a natural anti-biotic so the cream stays fresh in the whipper for up to 10 days if kept in a fridge. Suitable for making whipped cream as well as hot or cold ‘espumas’, sauces and mousses. In fact it will thicken anything with a high fat content or emulsifying properties. Unlike competing whippers it can be easily stripped stripped down for cleaning and replacing parts – which we stock. Airtight system – meets highest food safety and quality standards. Dimensions – 103(L) x 85(W) x 240(H) mm.